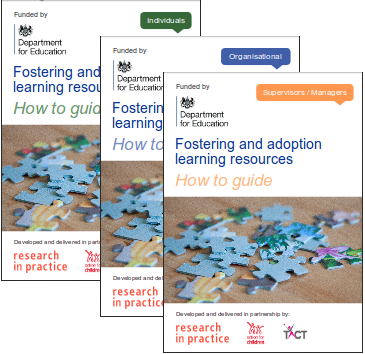 Welcome to the fostering and adoption learning resources from Research in Practice, funded by the Department for Education. The fostering and adoption How-to Guides are available to download. These learning resources, commissioned by the Department for Education in 2013, bring together research and evidence on key aspects of supporting looked after children. The materials are designed to support individuals and learning and development leads to build skills and knowledge for practice and Continuous Professional Development in this area. 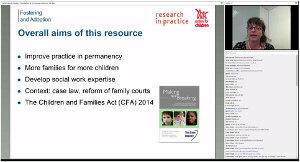 5. foster carers and adopters. The content for the resources has been informed by The College of Social Work’s Curriculum framework for CPD in this area of practice, as well as feedback from practitioners to ensure its relevance and reflect the sector’s needs. The How-to Guides are now available to download as complete handbooks, enabling trainers to provide a complete and consistent learning programme to delegates including planning tools and the recommended use of slides, templates and resources. These recorded webinars provide an overview of the resources, as well as suggestions about how they can be used to support continuing professional development. If you would like to speak to Research in Practice about holding your own learning event from this programme or would like further guidance on the learning resources, please contact ask@rip.org.uk.